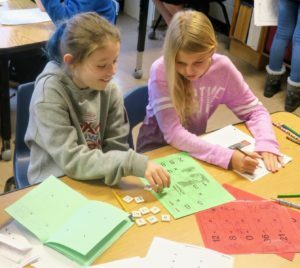 Our math program ignites in students an appreciation and delight for the symbolic language of numbers, for the puzzles to be puzzled, and for the mission of discovery with their peers. Beyond fundamental competency and proficiency, we help students be confident in their abilities to problem-solve, reason, and communicate mathematically. We draw on many resources to create a compelling student experience, including: Addison-Wesley and Math Their Way mathematics programs; material from the National Council of Teachers of Mathematics’ Curriculum Standards; Math Their Way; and many supplemental resources we think will spark our student’s interest. 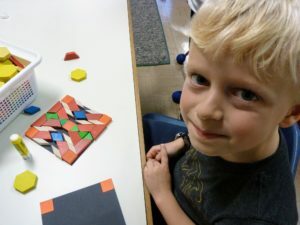 Exploration through activities, manipulatives, and experiences is at the center of learning for all grade levels. We emphasize applying math to realistic, everyday situations in concrete and meaningful ways. We value demonstrating an understanding of math concepts through written and oral language skills, as well as symbolic representation. Students, working together in partnerships to strategize and solve with problems, build real-world group skills. Developing strategies for unlocking story problems starts in Kindergarten and just gets better and better. Those fifth-graders are pros!